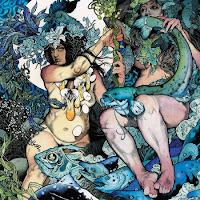 Savannah rockers Baroness have a new record coming out. Their upcoming Blue Record is scheduled to drop October 27. This release is the sister record to their 2007 release, Red Album. Is there or will there be a White record? Hey, I'm just askin'! You can grab "Swollen and Halo" from the upcoming record, HERE. If that's not enough for you, they're on the road. And, as booking would have it, they're going to make a stop in NYC. They'll be at Bowery Ballroom on November 20.